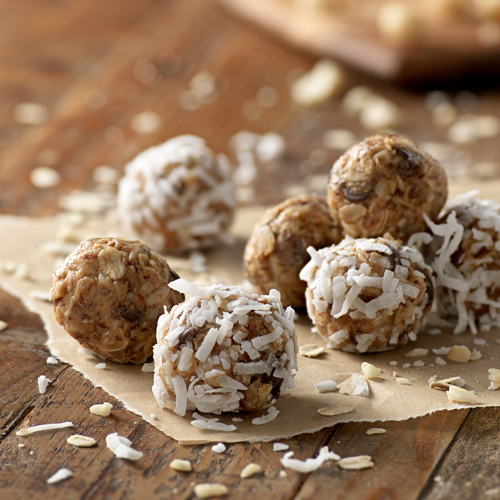 A quick snack recipe made with rolled oats, peanut butter, chocolate morsels, coconut, macademia nuts and dried pineapple. Stir together oats, peanut butter, chocolate morsels, wheat germ, honey, coconut, pineapple, nuts, and vanilla until well combined. With wet hands, form a tablespoon portion of the mixture into a ball. If mixture is not holding together as desired, add additional honey until balls hold shape. Roll in shredded coconut if desired. Repeat with remaining mixture to make 36 balls. Add 2 tablespoons vanilla protein powder to the oat mixture if desired.